I use a MacBook pro for my primary development these days, now that I am switching between ObjectiveC and C++. anyhow, If you are like me, you probably have an old Mac lying around doing nothing, or maybe its only getting lightly used. who knows. I don’t have a home server setup at the moment so I need to repurpose an old mac to act as my Git repository server while my home network issues were getting resolved. the first step is to enable the SSHd Damon on your mac. 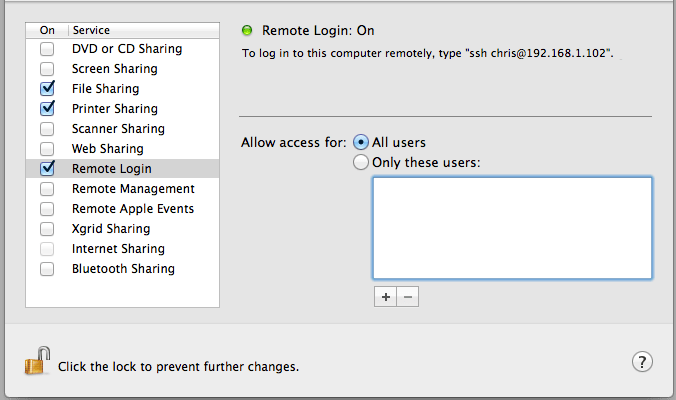 That is really, it is not too hard to enable SSH on your MAC. Be sure to configure the users you want to have access to the machine. So far with the latest version of OS X 10.7.3 everything appears to be working as expected.